The challenges of understanding biomedecine brings out new questions. Looking at the objectives of pharmaceutical or academic research lead us to consider new and more reliable models, representative of the living organs. Years of research have led 4Dcell to develop an innovative 3D cell culture technology for complete screening. 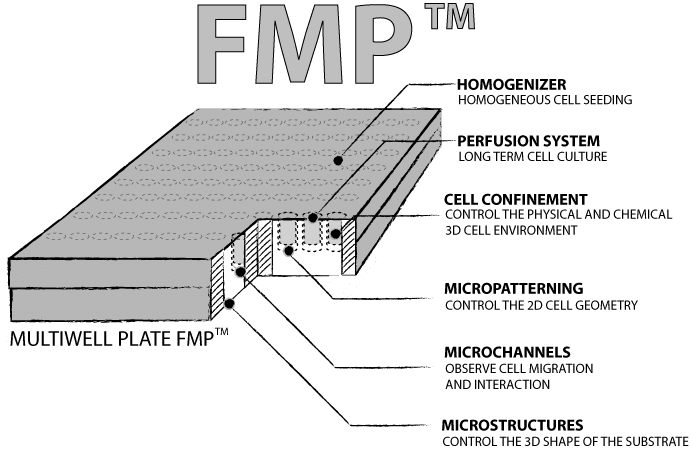 Controlling the cell microenvironment, the Fullscreen Multiwell Plate, FMP, allows getting closer to the organs functionning. All 4Dcell technologies are embedded in the Fullscreen Multiwell Plate FMPTM. The role of 4Dcell’s novel multi-well plates is to provide in HTS/HCS platforms new models that better predict and quantify, in vitro, the in vivo behavior of cells. Fully compatible with industrial standards, this new plate model embeds four innovative technologies developed by 4Dcell’s team of scientist and industrial experts. 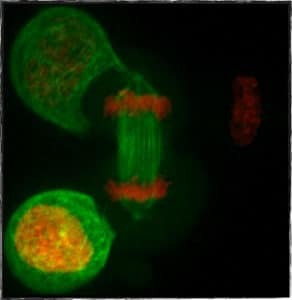 HeLa αtub-GFB H2B-mCherry cells dividing under 5 µm confinement (4Dcell dynamic confiner). The FMPsTM enable us to better control these parameters and offer new read-outs to decipher cancer progression and invasiveness. For instance, spindle assembly disorders of cancerous cells are easily assessed via FMPsTM Cell confinement technology. Dendritic cells migrating in microchannels of 5 µm width and 4 µm height. Extracted from a timelapse video taken by 4Dcell partners Lucie Barbier & Dr. Pablo Vargas, Curie Institute/UMR144 (2018). FMPsTM are the best tools to quantitfy immune activities such as cell migration, cell-interaction, nucleus plasticity, among others. For instance, FMPsTM Microchannels can quantify leukocyte extravasation ability, with read-outs such as: cell speed, persistence and ability to pass through constricted spaces. 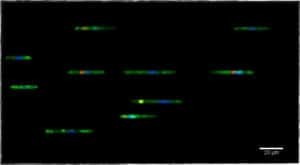 hPSC-CM on line micropatterns imaged by fluorescence microscopy. Dussaud S., Jouve C., Hulot J.S., 2018, INSERM / Paris Descartes, PARCC. FMPsTM offer simple and representative models highlighting organ specific read-outs. 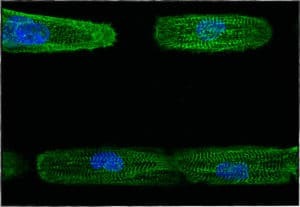 For instance, FMPsTM Micropatterns induce striation of cardiomyocyte leading to standardized beating properties and internal organization. 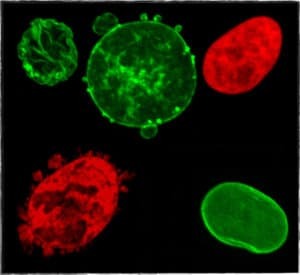 Nucleus of HeLa cells stained with H2B-GFP (red) and LMNA-GFP (green) before and after squeezing under 3 µm confinement (4Dcell dynamic confiner). Both cells on the right are before being squeezed, the one on the top left corner was squeezed and then retrieved and the two last ones are confined cells. The FMPsTM highlight alterations like these and one can measure molecular modifications more easily than with other models. For instance, cell nucleus healing in laminopathy is evaluated using FMPsTM Cell confinement by the observation of lamina reconstruction as a read-out.